The question, when slow cooking mushrooms, is how slow can you go. 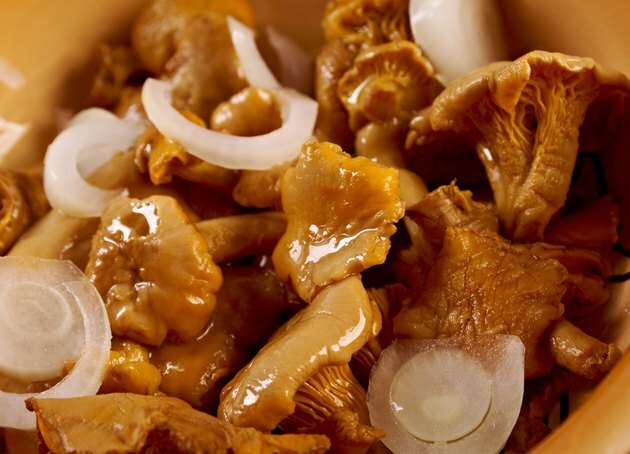 A long cooking time will give you tender and rich mushrooms, perfect to serve with steak, or over pasta or potatoes. You can opt to slow simmer mushrooms on the stove, cook them in a Dutch oven on low heat in the oven, or put the mushrooms and flavorings in a slow cooker if you need to be away from home. Wash the mushrooms or wipe them with a soft cloth, paper towel or mushroom brush. Use a sharp knife to cut off the hard ends of the stems. Heat 1/4 cup of butter or olive oil over medium-high heat for each pound of mushrooms you are cooking. Add the cleaned mushrooms and a clove of minced garlic to the pan once the oil is hot. Pour in 1/2 cup of chicken or beef stock per pound of mushrooms, along with a generous cup of dry red wine and a pinch of salt. Bring the mixture to a boil, then simmer on very low heat for six hours, covered. Add additional stock or red wine if necessary. Uncover and simmer for three more hours. Move your Dutch oven into a 250-degree oven and bake for the same length of time, covered and uncovered if you prefer. Cook mushrooms in the slow cooker by adding all ingredients to the pot at once, then cooking for the indicated time on low heat. Season to taste with salt and pepper and serve hot with crusty bread for dipping. If your budget allows, try this with portabella or crimini mushrooms, or a combination of various sturdy mushrooms. Check the pot occasionally and add more stock or wine if it's drying out.